The binational bank will fund technological and industrial initiatives between the two countries. Venezuela y Palestinian leaders agreed to start a binational bank between the two countries to be kickstarted with 20 million Venezuelan Petros. Newly re-elected Palestinian leader, Mahmoud Abbas landed in Caracas last night for a two-day diplomatic stay in Venezuela and already he and President Nicolas Maduro have signed an accord to create the binational bank to fund technological and industrial initiatives between the two countries. During the same meeting Venezuelan minister of tourism Marlenys Contreras and Palestinian director general of international cooperation, Imad Zuhairi agreed to bilateral tourism and hotel projects. Today’s session at the Miraflores Palace in Caracas also established an agreement to begin a Venezuela-Palestine business council to expand economic, banking, trade and financial cooperation among the countries. Both countries already maintain several accords in the areas of education, trade, energy, agriculture, culture, communication, sports, defense, security and health since 2009. 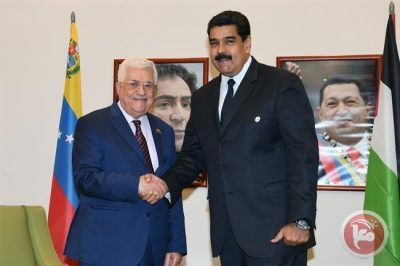 Palestine’s president went on to thank Maduro for the education scholarships that have enabled many Palestinian students to study in the South American country. “Dozens of engineers and doctors have graduated and others continue to study,” said Abbas. Abbas thanked Venezuela for its help in establishing the ophthalmology hospital in Palestine named “Hugo Chavez”, after the deceased Venezuelan president. The Palestinian head of state will continue his Latin American diplomatic tour to Cuba and Chile.